Not to be out done by the larger Wall Street banks, now U.S. Treasury is getting into the small business loan chest thumping pr blitz and bragging about how it is meeting the needs of Main Street. Check out this array of cool stats. 1) 90% of SBLF lenders have increased their small business lending! 2) 83% of SBLF lenders have increased their lending by 10% or more! 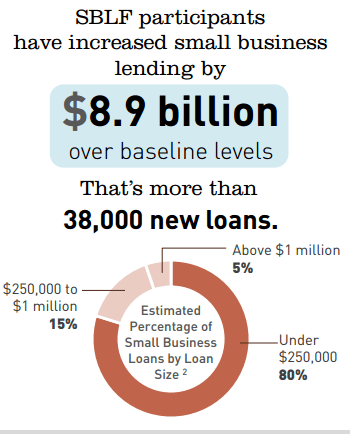 3) SBLF lenders have increased small business lending by almost $9 billion! Anyway, if you want to drown in 46 pages of stats go here.